Veterinary Technicians Eva Smoot and Greg Mueller traveled down to Rio Mora National Wildlife Refuge in New Mexico, where Denver Zoo actively works to restore grassland ecosystem processes and habitats for a variety of native species, including pronghorn, mountain lions and elk. They helped on-site Zoo staff with field research on grassland productivity, and the ways pollinators and plants influence each other, arroyo restoration, bison behavior studies and native seed collection. And while all of the research is important to wildlife conservation, it was the bison that made the biggest impression on Eva. One particular benefit the bison provide is their role in managing invasive plant species through their grazing and “horning” of the ground to uproot these invasive plants. For Greg, learning about the effects of invasive plant species on the larger ecosystem was one of the most amazing aspects of participating in the Zoo’s conservation efforts. “Finding out that invasive plants are pushing out native species within the Rio Mora National Wildlife Refuge and harming the local ecosystem was an important takeaway, and underscored the importance of the work we do there,” said Greg. In another part of New Mexico, Veterinary Technician Stephanie Hinkle participated as a research assistant studying Gunnison’s prairie dogs at Valles Caldera National Preserve, which is located northwest of Santa Fe. She took part in the final year of the long-term study conducted by one of Denver Zoo’s Research Associates, Dr. John Hoogland, to which the Zoo has contributed both funding and hundreds of staff volunteer hours. 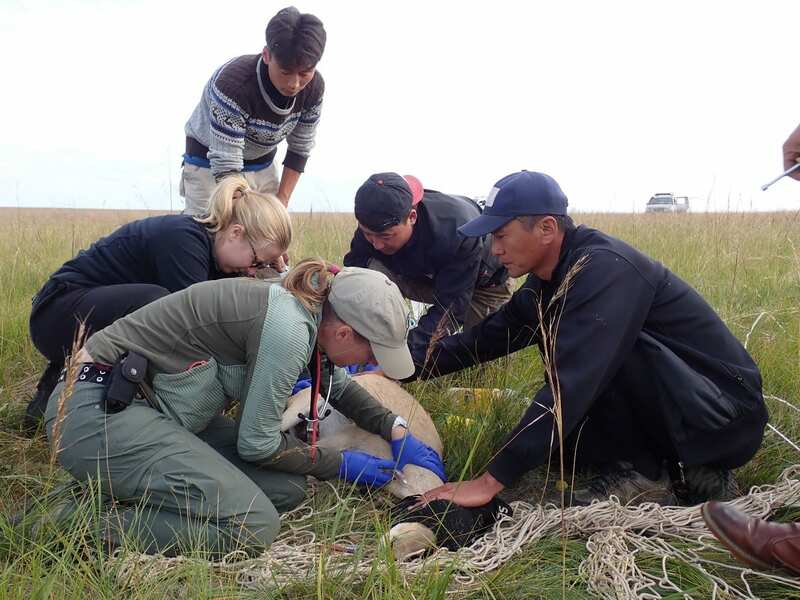 Her efforts live trapping, marking and observing individual animals during mating season supported Dr. Hoogland’s work on the behavioral ecology and conservation of prairie dogs. While the rodents may be a pest to ranchers and farmers, they are a key part of grassland ecosystems, acting as a staple food source for a number of iconic American predators. Dr. Jen Hausmann, and Veterinary Technician Kerry Owens made the long trek to Ikh Nart Nature Reserve in Mongolia, where Denver Zoo has worked for more than 20 years to conserve important wildlife and their unique habitats in partnership with park management, local herding communities and local, regional and national government officials. The team assisted with health assessments of wild species and monitored disease transmission between domestic and wild animals, such as argali sheep and cinereous vultures. For Dr. Hausmann, it was an experience of a lifetime, both personally and professionally. The cultural aspect of how local residents use the land and co-exist with the ecosystem was an interesting and exciting part of the experience for the team. Denver Zoo manages five field conservation programs around the world, including in Mongolia, Botswana, Peru, Vietnam and the Rocky Mountain/Great Plains. These projects are made possible by our dedicated staff members, who regularly travel to each location to contribute their unique skills and experience, and the support of our guests and donors. Learn how you can help Denver Zoo care for and protect animals at home and abroad. Be among the first to hear the latest animal updates, important stories and details about all the fun happening around Denver Zoo.